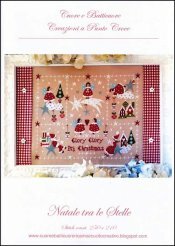 Natale Tra Le Stelle [J1638] - $15.88 : Yarn Tree, Your wholesale source for cross stitch supplies. Cross stitch pattern by Cuore e Batticuore. Christmas among the stars (Natale tra le Stelle) features Christmas angels among the stars. An angel is completing the Christmas tree by hanging the star, while standing on a cloud adorned with Christmas ornaments. Make a wish, as an angel stands on top of a shooting star. Relaxing on a star, Santa is taking a break from delivering gifts to all the boys & girls. Christmas has finally arrived! Stitch count 250 x 210. Stitched on #3643 Zweigart 36ct. Edinburgh Linen Light Mocha.